Age appropriateness: This documentary, part of the History Channel's "Empires of Industry" series, is not officially rated in the United States. It is safe for students of all ages to watch. The content is most appropriate for students in grades 7 through 12. Scroll down for discussion and review questions, as well as a list of names and vocabulary terms. Accuracy: The information contained in this brief video is highly accurate. There are numerous interviews with leading historians as well as with museum personnel (on-site). Complex processes and events are explained in ways that students can easily understand. This documentary encompasses the entire history of the steel industry in the United States, from colonial times to the present day. My biggest criticism is that this film, apart from a brief segment on the Homestead Strike, somewhat glosses over the rise of labor unions in the late 1800s. Unsafe working conditions, low wages, etc., are hardly mentioned at all. Monopolies are likewise glossed over. If this is the only video your kids watch about the American Industrial Revolution, they will be left with a very one-sided point-of-view. 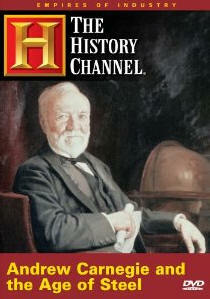 "Andrew Carnegie and the Age of Steel" is part of the "Empires of Industry" television series that ran on the History Channel in the 1990s. This video is divided into five sections: (1) Iron Works, (2) Genius, (3) Strife, (4) Merging, and (5) Rebirth. Discussion and review questions: (1) What role did John Winthrop the Younger play in colonial iron production? (2) Where does the term pig iron come from? (3) Describe the plantation system of iron production. (4) Who developed the hot blast process? (5) Describe Andrew Carnegie's work during the Civil War. (6) What did Henry Bessemer contribute to iron production? (7) What Illinois city was rebuilt between 1875 and 1890 following a massive fire? (8) What Pennsylvania city led the nation in steel production in the late 1800s? (9) How long was the standard work week in steel mills during the late 1800s? (10) Who was Henry Frick? (11) Describe the Homestead Strike. (12) Describe the deal struck between Andrew Carnegie and J.P. Morgan. (13) What Indiana city was founded by U.S. Steel in 1906? (14) How did the Great Depression affect the American steel industry? (15) How did World War II affect the American steel industry? (16) What was life like for steel workers in the 1950s and 1960s? (17) What do you imagine that the American steel industry will be like ten years from now?